This post is Part 13 of a series to augment the Atlas of the Known World available for free download. Start with Part 1 here. Windswept plains of the gryphon riders. You voted The Front Rishi winner of January 2016 by 41%. 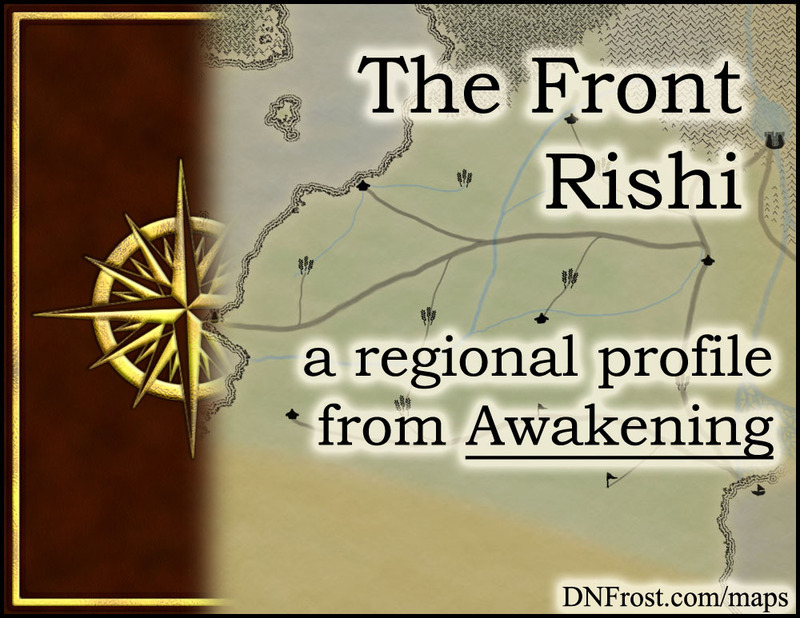 In Chapter 9 of Awakening, the Front Rishi comprises the western half of the Rishi Plains. It borders the Forests of Kalrein to the north, the Red River Ka to the east, and the badlands to the south, where Old Ryerin once stood. Windswept and flat, the Front Rishi is drier than the river deltas of the Back Rishi, though consistent rains ensure the viability of its arable land. Four seasons grace these plains with hot, breezy summers and cold, snowy winters. This region also borders the D'jed Mountains, the Gulf of Lohki, and the Great Sea. Most of the Front Rishi is devoted to sprawling ranches and hardy wheat fields. With little hope to compete with the agricultural prowess of the fertile deltas to the east, most denizens of the Front Rishi devote their land to pasture. Herds of horses graze the land, and large flocks of wyverns roam the grasses in search of insects and vermin. Wheat farmers commonly invite wyverns into their fields as a form of pest control. Not much land remains unclaimed in modern times, and the Front Rishi's greatest predator, the gryphon, no longer breeds in the wild. They are, however, bred in captivity, thanks to a number of rookeries where gryphon riders uphold their traditional lifestyle. Modern styles of dress for plains elves vary widely across regions and individuals, but gryphon riders maintain their traditional styles of dress. Gryphon rider men typically wear their hair just past the tops of their ears. Women never cut their hair, instead wearing it in a single long braid hanging down their backs, the last few inches wrapped to prevent fraying. Gryphon riders of both genders wear loose linen clothing in a variety of colors, usually associated with the rookery from whence they hail. The most notable fashion of the gryphon riders, however, is their lack of shoes, which they forsake as an inconvenience when riding their mounts. Plains elves make poor elemental mages, but their special magics are quite strong. Renowned for their Metal magic, plains elves excel at smithing and smelting. Their latent Animal magic is decent as well, generally stronger than their mountain cousins to the north. The sensory magics of the plains elves are the most potent of all the elf races, and plains elves are good with both Sound magic and their latent Touch magic abilities. While rare throughout the Known World, Music magic is present in the cocktail of plains elf magics, and it is not uncommon for wandering bards to demonstrate the rare ability to enchant listeners with their melodies. Gryphon riders prize independence and leadership skills, as well as honesty and diligence. Magic is upheld as a sacred exchange of energies, and it is usually associated with the colors green and blue. Gryphon riders dwell in rookeries, autonomous villages dedicated to the preservation of gryphons and the traditions of gryphon riding. While not every resident of the rookery rides a gryphon, at least one family member must be a gryphon rider in order to live in the rookery. Family is important to the gryphon riders, and no one is expected to forsake family ties in order to become a gryphon rider. The rookery as a whole is considered one large extended family, and each group of riders, known as an aerie, is viewed as a smaller family nucleus. It is offensive to undermine these family bonds, or to insinuate that a gryphon rider cares little about his or her fellow riders. Plains elves celebrate the new year on the winter solstice, as per the ancient solunar calendar of the merfolk, which is the official calendar of the Allanic Empire. While age is counted in years, gryphon riders measure maturity through the training and discipline of one's gryphon. Regardless of age, a rider with a newly hatched gryphon is considered a novice, and more experienced gryphons earn their riders prestige. Once a gryphon fledges and begins to fly, the rider is celebrated as a full member of the rookery. Adult riders are expected to conduct regular training drills, including flying in formation, and to impart the traditional skills of gryphon riding to younger riders. In olden times, each rookery was funded by a patron from one of the wealthy farms in the area, and in turn the riders of that rookery surveyed their farmland and protected crops from thieves and wild animals. These days, vast ranches have replaced most of the old farms, and remaining farmers fund their own protections. In addition, gryphon riders have become increasingly irrelevant due to the modern presence of imperial guards throughout the Plains of Rishi. Now rookeries are mostly self-sustaining, with the children of current gryphon riders taking up the next generation of hatchlings, while youth outside the rookeries tend to chase positions of wealth and esteem within the earth-bound aristocracy. Like all plains elves, gryphon riders speak Allanic as their native language. Dialects vary slightly between rookeries, but in general their Allanic sounds informal and choppy compared to the tongue of their mountain cousins. Due to loud winds during flight, gryphon riders have a sign language used to communicate while in the air. Not surprisingly, many common gestures have worked their way into spoken conversation, and a discussion between gryphon riders may be construed as tense or even hostile if the accompanying hand signals are omitted. Cultivated over centuries of riding tradition, their sign language bears resemblance to the hand signs of the Sutek Desert, which are employed by the pegasus riders there. In the book Awakening, Sharis and her brother Fal'on are gryphon riders from the rookery of Vedosr'f'n. While they attended university in the Back Rishi, a tragic bout of plague wiped out their rookery some years ago. Now the elf siblings roam the Plains of Rishi, bartering their services as gryphon riders for goods and shelter. When they overhear two wraith-like creatures discussing Allana's brainwashed empress, Sharis and Fal'on set forth on a mission to save the empire.